By Allan Fox: WBO super middleweight champion Robert Stieglitz (44-3, 25 KO’s) will be making his first defense of his WBO title this Saturday, July 13th, against #10 WBO, Yuzo Kiyota (23-3-1, 21 KO’s) at the Energie Verbund-Arena, in Dresden, Germany. This is an optional title defense for the 32-year-old Stieglitz so he opted to take an easy fringe contender rather than a dangerous contender that might trouble him. Stieglitz beat Arthur Abraham by a 4th round TKO last March to win the WBO super middleweight title back from him after having lost the belt last year to Abraham by a 12 round unanimous decision in August 2012. Stieglitz and his trainer did a good job of doing their homework in studying Abraham’s fighting style and coming up with the perfect plan to beat him by coming out fast and unloading on him with nonstop punches until the fight was stopped because Abraham’s left eye had swollen completely shut. Stieglitz won’t have to worry about coming up with any kind of perfect strategies to beat the 29-year-old Kiyota because he should be able to beat him just by showing up. The World Boxing Organization is the only sanctioning body that has Kiyota ranked in their top 15, and when you see that it tells you that there are major question marks about the talent for that fighter. Kiyota hasn’t faced any quality fighters yet during his 11-year pro career. He’s been beaten three times in losses to Jameson Bostic, Norifumi Suzuki and Fukutaro Ujie. 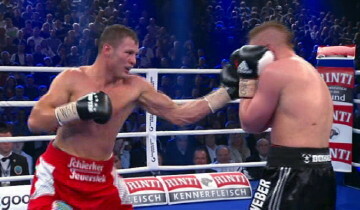 If Stieglitz gets past Kiyota, he could be facing George Groves or another rematch with Abraham later this year. It’s likely he’ll choose not to face Groves yet, and instead will look to face Abraham again or go for another optional title defense. If Stieglitz fights like he did last March against Abraham, he’d be tough for anyone in the super middleweight division to beat. He looked dramatically improved in that fight.